In 1983, the year that I graduated high school, a fellow classmate I’ll call Sheri passed away at the age of 18. She should have graduated with the rest of us. She should have gone to college or taken a gap year and worked at The Limited. She should’ve gotten her dream job or realized it wasn’t all it was cracked up to be. She should’ve fallen in love once or twice or, if she were like me, six times before settling down. She should have had the opportunity to learn from her mistakes and try again. She should have been able to hold her newborn baby in her arms, if that’s what she wanted. Instead, during the fall of 1982, her ex-boyfriend, lured Sheri to a friend’s garage and strangled her to death. Some of the details of Sheri’s story have slipped away from me over the years. But I remember Sheri and her boyfriend joined at the hip since junior high school. I remember thinking they were an odd match. Sheri was pretty and popular, her boyfriend lingered in the background, silent, withdrawn. By the time we all got to high school Sheri seemed to fade away. She was still there physically, leaning up against lockers with her boyfriend, driving away from school in his car, but she seemed somehow diminished, invisible. I’ll never know if this devolution is actually true, or if it just seems true now that I know how Sheri’s story ends. During our senior year Sheri finally broke up with her boyfriend. By all accounts he was angry. Several weeks after Sheri went missing her corpse was found in a shallow grave in one of the ubiquitous orange groves that typified our home town. Her body was so decomposed she could only be identified by dental records. During our graduation ceremony that spring we honored our fallen classmate by observing a moment of silence for her. Afterward we lined up to receive our high school diplomas, the tickets to our future and left Sheri back there on that football field. She existed only, for me, in that silent moment. I didn’t want to dwell on something so dark and unmoored from the world as I wanted to see it. Bright with possibility. 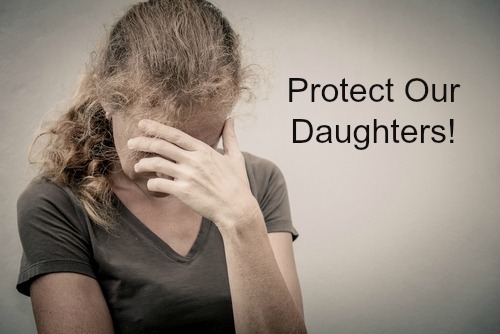 Several years later I worked on a movie-of-the-week for Lifetime TV based on a book by Dr. Jill Murray called, But I Love Him: Protecting Your Teen Daughter From Controlling, Abusive Dating Relationships. (this is not a sponsored post) I interviewed Dr. Murray and was astonished at the high statistics of teenage girls who were involved in violently abusive relationships and even more so by the chilling number of girls who’d been murdered by their abusers. The murders would usually occur after the girl left her abuser, just as Sheri’s had. At the time of this project my own daughters were just 15-months and 3-years old, so I felt a safe distance from being the parent of a child in jeopardy. That happened to other people’s children, not mine. Now my girls are almost 11 and 13. They’re still too young to date, but their coming-of-age is just around the next corner. This, coupled with what happened to my acquaintance’s daughter, has brought me back full circle to Sheri. I’m humbled and horrified by the excruciating pain her family endured and perhaps still endures. I find it’s time to honor Sheri again by disseminating what I’ve learned in my research on Teen Dating Abuse in the hopes that awareness can lead to prevention. 1. Drug and alcohol abuse in the home by mother and/or father. 2. Witnessing violence in the home. 3. Absent, neglectful or unstable parents. 4. An authority figure who regularly humiliates and shames him; even in public. IS MY DAUGHTER IN DANGER? • Before my daughter met her boyfriend, she had more friends than she does now. • Her grades have declined in the past weeks or months. • Before she started dating him, she was more outgoing and involved with her family, school activities, and/or place of worship. • She frequently cries or is very sad. • If he texts her, she must call him back immediately. • He told her that he loved her early in their relationship. • He is jealous if she looks at or speaks casually with another boy. • He accuses her of behavior she doesn’t actually engage in. • He is aggressive in other areas of his life: he puts his fist through walls or closets, bangs his fist to make a point, or throws things when angry. • He frequently roughhouses or play-wrestles with her. • She makes excuses for his poor behavior or says it’s her fault. • They talk on the phone several times a day or for long periods. • He has a “tragic” home life: he is or was physically abused or verbally demeaned, and/or one or both parents are alcoholics or use drugs. • He frequently gives her “advice” about her choice of friends, hairstyle, clothes, or makeup. • He calls her demeaning names, then laughs and tells her he was only kidding or that she’s too sensitive. • She has become secretive since she started dating him. She is miserable whenever she is apart from him. • She has recently become very critical of her appearance, talents, or abilities. • She frequently has to explain herself to her boyfriend or often says she’s sorry. • She has bruises she cannot explain or appears nervous about explaining them to you. In re-reading Dr. Murray’s list I can see that one of my earliest relationships was emotionally (though not physically) abusive. I was fortunate to emerge from that relationship and realize I needed therapy so I could make healthier choices. Sheri never got that chance. If you’re a teen in an abusive relationship or you suspect your child is in an abusive relationship there are several resources. You can call or email: Love Is Respect or The Hotline are just two of them. Again, this is not a sponsored post. I highly recommend Dr. Jill Murray’s book because I think it’s an excellent resource for parents and teens. I think it’s a good book for young girls to read even BEFORE they start dating. It’s good for them to be able to discern the warning signs and red flags of an abuser before becoming too enmeshed. Finally, to both parents and teens, remember that you’re not alone and there is help. If this story resonated with you feel free to read my other posts on Women’s Safety. And don’t forget to OPT-IN to my Newsletter HERE.